Powerhouse forward Viliame Kikau has signed a new deal with Penrith. The contract extension means the 23-year-old Fijian international will remain with Panthers until at least the end of the 2022 season. “It’s very exciting to know I’ll be at Panthers for the next few years,” Kikau said. “There are so many talented players at the club and I really enjoy their company. “It was a big decision to re-sign and I made it with the full support of my family, which is most important to me. Born and raised on the tiny Fijian island of Bau, Kikau grew up playing Rugby Union before being scouted and recruited by North Queensland Cowboys in 2014. He would go on to score 32 tries in 42 games during two seasons as a front row forward for the Cowboys in the National Youth Competition. 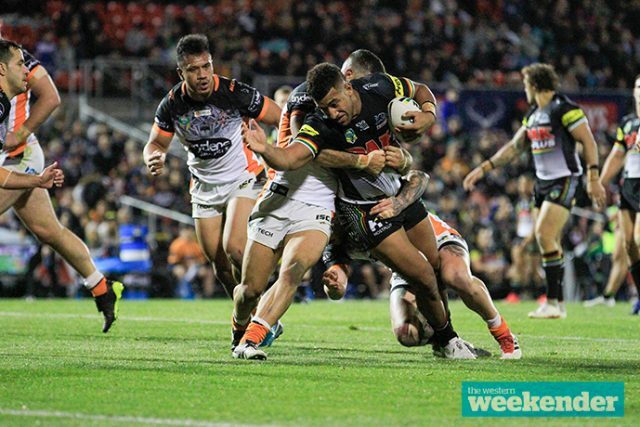 Kikau joined Panthers in 2016 and while his first season was hampered by injury, he eventually earned his NRL debut against Wests Tigers in Round 2 the following year. He finished 2017 as a member of the club’s premiership-winning ISP side and then played a starring role for Fiji at the 2017 Rugby League World Cup. This season Kikau has made a significant impact on the left edge of the Panthers attack, averaging 130 running metres, four tackle breaks and two offloads per game. “Viliame is an incredible young man,” Panthers Executive General Manager Phil Gould AM said. “His story is a source of inspiration for all youngsters who dream of playing in the NRL, not the least of which will be the many young kids from his homeland in Fiji. “We are very lucky to have him at our club as ‘Billy’ has now established himself as one of the most promising forwards in the NRL. The re-signing of Kikau follows the recent contract extensions of Reagan Campbell-Gillard (2024), Kaide Ellis (2020), Caleb Aekins (2020) and Nick Lui-Toso (2020).